Geneva 2012: Ssangyong XIV-2 convertible | What Car? The Ssangyong XIV-2 convertible SUV concept car has been unveiled at the 2012 Geneva motor show. The XIV-2 follows on from the XIV-1 supermini-sized crossover that appeared at the Frankfurt motor show last year. The concept car's soft-top roof opens automatically, and folds down where the rear window would be, in a similar style to the Fiat 500C. 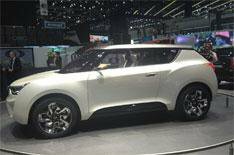 While the XIV-2 and the XIV-1 are both concept cars, they preview a supermini-sized SUV that Ssangyong plans to launch in 2013. At 4166mm long and 1820mm wide, it is marginally larger than the Nissan Juke, which Ssangyong will target with the final production version of the XIV-2. One petrol engine and one diesel are on offer, both 1.6-litres. The petrol produces 123bhp and 116lb ft of torque, while the diesel manages 128bhp and a healthier 221lb ft. There will be the option of a six-speed manual or automatic transmission on both engines and stop-start technology has been confirmed, too. The manual diesel model emits 106g/km CO2, the automatic version 112g/km. The petrol comes in at 121g/km in manual form and 127g/km mated to an automatic box. The final price hasn't been revealed, but the production car is expected to cost from around 15,000.